I bought the Photosmart D5360 printer in Denmark. It says on your site that 350XL and 351XL cartridges are compatible? Can you confirm? If not, what are my options? Thanks in advance, Peter. We can only guarantee that the genuine and compatible HP 350 / 350XL and 351 / 351XL ink cartridges listed here will work in a HP Photosmart D5360 printer that was purchased in the UK. Ink cartridges are specific to the region in which the printer was bought, so if you purchased your Photosmart D5360 printer in Denmark you're likely to require cartridges with a different manufacturer part number to the ones we supply. It might be possible for HP to change the region code on your HP D5360 printer so that it can accept UK cartridge numbers such as HP 350 / HP 351 but we don't deliver outside of the UK. We'd advise you to check the correct cartridge numbers for your region of the world by contacting HP and they shouid also be able to direct you to a local supplier of this ink. Crisp and clear documents are what the HP D5360 printer does best. After some time your HP D5360 will gobble up all of your printer ink, and when it happens you'll realise that new HP D5360 ink is generally costly. However, you don't need to fret about paying the steep prices you'll find on the main street because here at Cartridge Save you can purchase all the HP D 5360 cartridges you'll ever want at very low prices. Start saving cash on your ink by ordering online with Cartridge Save! You don't have to pay the high cost of a D-5360 original cartridge or D5360 compatible ink on the high street when it's simple to save a bundle of money buying with Cartridge Save. You have total confidence when you buy your Photosmart D5360 ink cartridges from us seeing as every one is underwritten by a no quibble money back guarantee. Take into consideration that every single purchase comes with free delivery, typically arriving at your address on the following day! Picking a home printer can sometimes be fairly challenging, but this is really just a result of the amount of options which you have to consider. 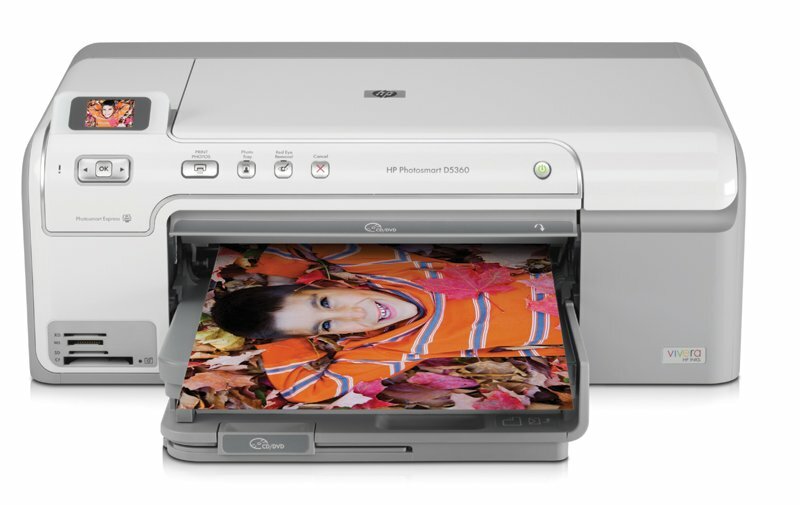 So, why does the HP Photosmart D5360 stand out from the crowd when there are so many home printers to pick from? Well, if you are seeking out a simple and yet highly effective home printer, the HP Photosmart D5360 ticks a fair few boxes on anyone's check list. Firstly, in terms of design alone, the HP Photosmart D5360 has plenty to shout about. There is, after all, a fine line between a printer being interestingly designed and a printer being garish. Thankfully, the HP Photosmart D5360 is both attractive and yet subtle at the same time. A white finish is complimented by a liftable scanner lid and the overall look of the HP Photosmart D5360 is actually rather pleasing on the eye. The HP Photosmart D5360 is a very easy to operate machine and the user interface is handily placed and designed with ease of use in mind. Still, there are further perks to the HP Photosmart D5360 such as the print outs themselves. As with the entire Photosmart range, home photography will benefit hugely from the use of a HP Photosmart D5360 as results are clear and crisp. Picking faults with the HP Photosmart D5360 is a bit of a challenge, and the only real downfall might be the price. However, it is not outlandishly tagged price wise and if you seek quality, which the HP Photosmart D5360 certainly provides, then this item is entirely worth every penny.